In a new interview with DuJour, Outlander‘s Sam Heughan discusses fan support, becoming a Highland warrior, and his favorite part of filming the series. The interview also includes a new behind the scenes photo. Were you familiar with the books before you started filming? I hadn’t actually heard of them until I began auditioning. Once I read them and discovered this huge world that Diana had created—and what a fantastic character Jamie was—I was super excited by the prospect. The novels have a massive following, with social media sites exploding since the series was announced and it hasn’t even aired yet. We just premiered at Comic-Con and the support there was insane; it was so mad! It was great to see the fans that have read the books and recognize lines or moments but also the ones who were discovering the show for the first time and enjoying it just as much. The locations where you film are breathtaking; Scotland is almost another character on the show. It’s hard to realize that it’s not CGI—it’s real. And the landscape is absolutely amazing. When people see it, they’re going to fall in love with Scotland. 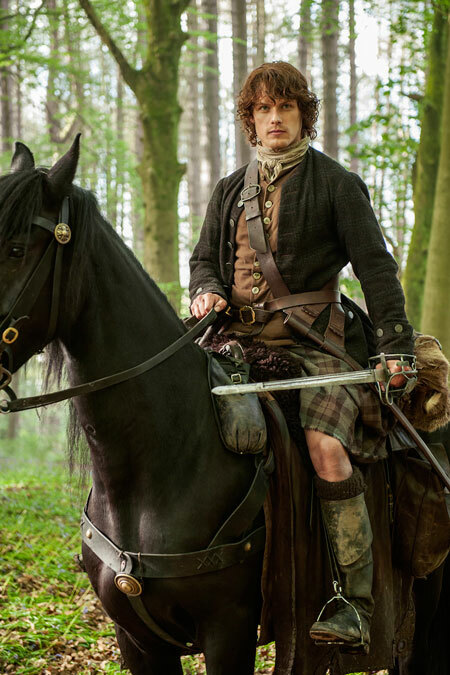 Jamie is a true Highlander warrior—just in the first few episodes he gets shot at, punched and thrown off a horse. How much did you have to prep for such a physical role? He spends so much time getting beaten up [laughs]. The first few months I was covered in bruises and mud, but we try to be as authentic as possible. I trained for six weeks before we started filming, which actually helped me survive the shoot. And then we had a boot camp with the other actors where we did lots of horseback riding and sword fighting. Boys and swords—it was a great bonding experience. Is it difficult to get into character? The chance to speak Gaelic was definitely a way into the character. 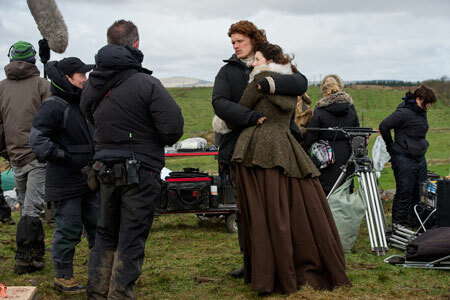 It’s the root of who Jamie is and his culture. The costumes do so much for us too. I get to wear a kilt, which is an interesting piece of clothing. What’s been your favorite part of filming so far? For me it was returning home to Scotland—it’s a dream come true to be able to ride a horse through the Highlands, do battle and have this wonderful story. This entry was posted in Sam Heughan and tagged DuJour, Interview, Jamie Fraser, Sam Heughan by Stephanie Bertone. Bookmark the permalink.